Directions from Charleston: Take I-64 west until you reach the Milton exit (28). Turn left at the end of the ramp. Go approximately 1/4 mile until you reach the stop light next to Wendy's. Turn right onto US Rt. 60. Continue on Rt. 60 for 4.7 miles until you reach the high school that is located on the right side of Route 60. Directions from Huntington: Take I-64 East until you reach the Mall Road exit (20). Turn left at the light at the end of the ramp. Then turn left at the next stoplight at the intersection of Mall Road and US Rt. 60. Continue on US Rt. 60 for 3.1 miles until you reach the high school that is located on the left side of Route 60. The course is open year round for teams to come down and train. If you plan to visit, please contact Coach Parsons by e-mail at WVStateMeet@Gmail.com. This will ensure that there are no conflicts and that we are available for any questions if you need our assistance. 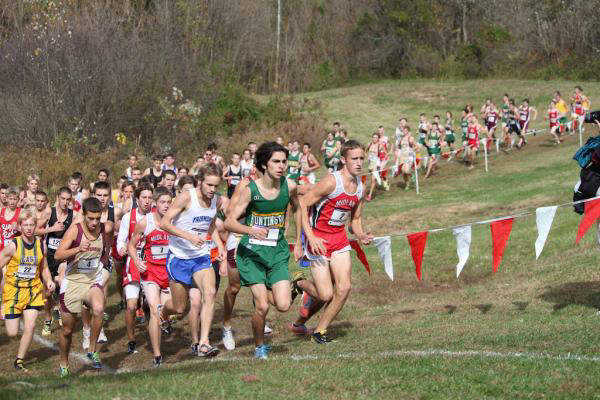 All State qualifying coaches must email your coaches names to wvstatemeet@gmail.com (these coaches must be recognized by the WVSSAC as head, assistant, or volunteer Cross Country Coach). We will add your coaches to the team list, so they can get in free at the state meet. We will check them off the list at the gate when they arrive. They must be on this list to get in free or otherwise they will have to pay the admission fee. The course will be open at 1:30pm for preview until 6:30pm. However, don’t plan to enter the school grounds from 2:45pm – 3:30pm because of traffic letting out from school. Plan your arrival around this time. There will be a pre-meet mixer held during Friday in the Auxiliary Gym 4:00PM-6:00PM. Healthy snacks and drinks will be provided. There will also be hundreds of pictures from past state meets decorating the gym. Coaches may also pick up their meet packets during this time in the Auxiliary Gym. All members of qualified teams will be admitted for free (including those who are not competing), courtesy of Cabell Midland HS. However, in order to receive free admission, the athlete must appear on the school's WVSSAC eligibility form. Individual qualifiers are admitted FREE, but their teammates not competing must pay an admission charge. Admission fee to state meet is Adult $8.00 and Students $7.00. Prices are set by the WVSSAC and all money goes towards putting on the state meet. There is NO profit on the state meet. Please let your parents and fans know ahead of time the prices of the state meet. The team entrance will be behind the school near the softball fields at “Tent City”. Meet packets will be available in the Hospitality Room at the track. 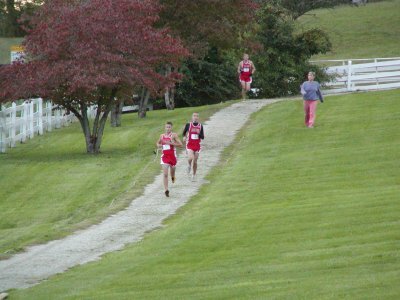 Cabell Midland’s cross country course offers a balanced combination of hills and flats that is one of the best groomed courses in the state. 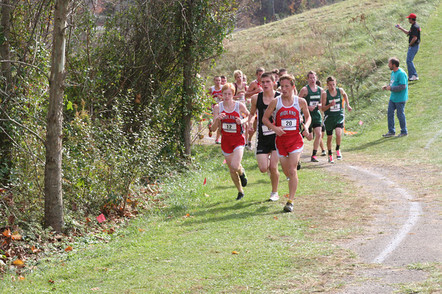 The course runs on the campus of Cabell Midland High School and the Cabell County Farm. It is very spectator friendly and allows coaches to monitor the action closely for the majority of the race. The course starts on the field, located between the school and the track stadium. The start is flat, with a gentle turn at the end of the soccer field fence that takes the runners around the baseball stadium. The runners reenter the practice field area and continue along the sideline, where spectators standing on the road way line the fence. They then turn right, crossing the access road and dropping into a small dip that takes them onto the band field. The runners run along the edge of the field until they reach the first and toughest climb of the course. The hill begins with a short, steep accent onto the path, then turns right and climbs for the next 300 meters before leveling into the horseshoe. Once in the horseshoe, the course takes the runners back through the woods, and then reverses back into the clearing, bringing the runners to the first mile marker. ​After the mile marker, the athletes run for another 50 meters before turning right and descending behind the barn. They then reach a flat path that takes them on a loop through a field, ending at the base of the next climb. The runners climb the hill, running around the front side of the house before connecting to the gravel path. The gravel section begins with a short, steep descent with a sharp left turn at the bottom before leveling, taking the runners around the side of the hill parallel to Howell’s Mill Road. After another downhill, the path moves upward once more for the final climb, ending as the runners lap around a small cemetery. The runners continue on the path back towards the barn, returning the runners to the horseshoe. After making a small loop back in the horseshoe that ends just before the 1 mile marker, the runners come through 2 miles. ​The final mile of the course is either downhill or flat, making it very fast. Almost immediately following the 2 mile marker the runners start down the hill. They go about half-way before reaching a short hill that takes them on a short downhill loop around the pond. From there, they continue down the hill, running the same path that they did during the first mile, taking them back to the start area. Upon reaching the start area, the runners turn right and run along the fence line until they reach the softball stadium. The runners run behind the softball stadium then veer to the right and round the baseball stadium again. They then drop back into the dip and round Gabriel’s Curve, turning right and entering the football stadium. The runners complete the final 200m on the "Chris Parsons Track", finishing at the 50m line in front of the main bleachers. Quick Preview film of the Midland Cross Country Course.